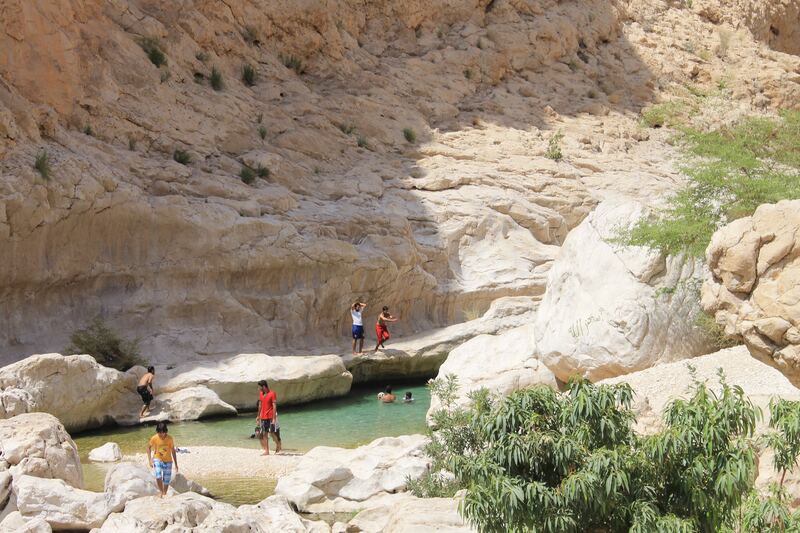 Wadi Bani Khalid Located 203 kilometres (126 miles) from Muscat. Take the Bidbid – Sur Road in Al Sharqiyah South Governorate, which forks into a side road leading to wilayat Bani Khalid , then weaves up across the eastern AlHajar Mountains to Bida village deep in the mountains. There you can enjoy the spectacular views of the fertile valley with its spreading trees and abundant water that tumbles down as waterfalls in some areas to form natural pools of water. The road then cuts through the valley to reach Muqal town, well known for its cave. To explore this cave, you’ll have to exercise great caution as you may need to crawl or even scramble in some places. Here the gushing waters creates a loud rushing sound and collects in pools, only to dissipate and gather – once again – in small lakes which the villagers have used to fill three irrigation canals. After breakfast in hotel you will meet the Omani Guide at 7:30am . The drive take around 2 hours toward to Wadi Bani Khalid through the mountains passing through Sumail Gap and across the desert plains through the townships of Bidbid, Al Qabil and Ibra. Visit the abandoned village of Al Mansfah near Ibra . Continue the drive to the Wadi Bani Khalid Enjoy swimming in neutral pools have lunch there than drive back golden sands. The great Wahiba Sands are located in dunes 200 km long and 100 km wide running south from the Eastern Hajars to the Arabian Sea. The Dune Bashing on the golden sand dunes and visit the local Bedouin have Omani Coffee and Camel rides if there is time . After that we drive back to Muscat arrive at 5:00 pm.